We are members of the Nation-wide Challenge Dealer Group. Currently our Fuels are supplied to us by Farmlands Fuel (formally CRT Fuel) – who source it from Caltex. All the fuel we supply is of a very high quality. We pride ourselves by offering full service on our Forecourt for all hours that we are open. Our Forecourt is large and spacious, making it easy to get in and out. We now accept up to 10 cent Supermarket Fuel Vouchers. This includes Vouchers that say they can only be used at PAK N SAVE Timaru. We also give you 6 Cents/l off for 4 Cent supermarket vouchers – an extra 50% above their face value – and we accept any fuel voucher from all the major Supermarkets (providing they are a month or less from issue). We offer an 15 Cent discount on any fuel purchased from us by Super Gold Card holders. It doesn’t matter how many litres you buy, the discount applies, and not limited to a minimum purchase but has maximum of 100 litres . This is a genuine no quibble discount for all the older members in our community. We also offer a 10% discounts for Cash on all WOF’s, Servicing and labour charges in our Workshop for Super Gold Card holders. Please ask us about this. 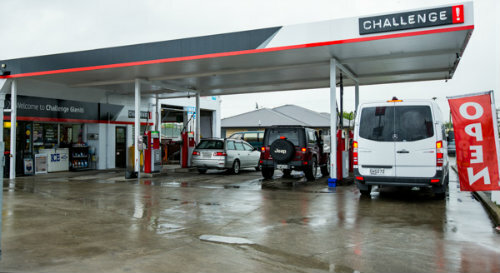 All Challenge Service stations are Locally Owned and Operated, so dealing with us supports your local community. 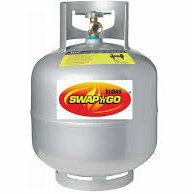 LPG Refilling and Swap a Bottle. We are able to fill all small gas cylinders up to 9kg on site for you. Alternatively we can swap a 9kg gas bottle for another one. Provided your cylinder is not damaged it is as easy as swapping the bottle and paying the fee. So long as the cylinder is in an acceptable condition we will even swap out of date cylinders for you at no extra charge, which saves you the full re-inspection Fee.